Warm white wine vinegar in a pot set over medium heat. 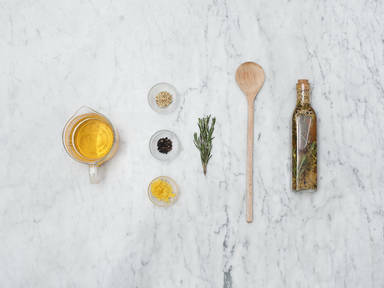 In a clean and dry bottle, add your favorite aromatics, such as black pepper, fennel seeds, lemon zest, and rosemary. Using a funnel, pour the warm vinegar into the bottle. Seal tightly with a cork. Allow to infuse in a warm place for 1 – 2 weeks. Enjoy with salads or soups!